I've been silent for several weeks now and have only come up for air now that our house move is nearly complete. So the garden and blogging have been neglected but as the pile of boxes shrinks I've been able to get out on the plot and begin the end of season tidy up. But it's also a time for planting and this picture is just some of the garlic sent to me by Patrick at Bifurcated Carrots. Thirteen varieties in all it will be interesting to see how they do on the allotment and also in the vegetable plot at the new house (I'll post seperately on this). Maybe later next year the recepients of Patrick's generosity would post their experience with the different varieties and we can see what does best, where and possibly guess at why? When it comes to vegetable seeds I'm like a child at the supermarket checkout eyeing up sweets. 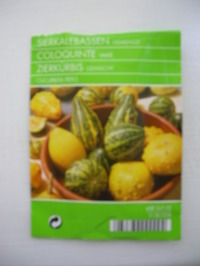 They're there, I want them and so I couldn't resist buying yet another packet of seeds that I saw in a Brussels housewares shop last week. It looks as if I've bought a variety pack of squashes and I presume they're edible (aren't all squashes - it's just some are tastier than others ????). I think the labelling is in Dutch, French and German(Sierkalebassen Gemengd; Colquinte Varie; Zierkurbis Gemischt). Maybe some native speakers can help me on that. Now the question is where to fit them in the vegetable patch as I'm less interested in them than my Butternut squash whose space is already allocated. Maybe I'll try and negotiate space in my wife's sweet pea border. 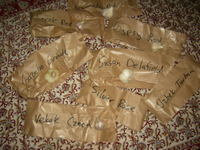 I thought that I'd finished sowing potatoes until a package arrived from Norway today with four 'Lumper' seed potatoes. Popular around the time of the Irish famine, I'm hoping for high yields and more importantly finding out what it tastes like. So for this year my heritage/heirloom potato varieties are Forty Fold, Mr Little's Yetholm Gypsy, Edzell Blue and Lumper. It's amazing the difference a few weeks make. The soil has dried a fraction and it's warmed up. Weeds are beginning to appear and grow away. Outdoor sowing is underway. I was a little wary of sowing Rebsie's Mr Bethell's Purple Podded pea directly in the ground on 6th March but they were showing through by 31 March and there's been about 100% germination. So the mice didn't get them; now it's the turn of the birds and slugs. The broad bean Windsor, sown on 6th March and swapped with Patrick at Bifurcated Carrots broke soil on 3 April and it looks as if 70% made it through so far. I've hardened of some Norli (100% germination rate) and Alderman peas (poor 50% germination rate) both varieties sown in pots on March 1st and these are now planted out followed by a direct sowing in the ground today of another row of Norli and Alderman. Let's see how they do this way. All but one of my saved sweet pea seed has germinated. I wonder will they come true to form and produce another excellent crop of chocolatey purple flowers? Seedlings from the mixed lettuce and rocket, sown on 20th March, are now showing - time for another sowing in a few days. A beautiful, crisp and sunny morning was made even better by the arrival of a package from Rebsie, Daughter of The Soil, thank you. I can now look forward to trying Mr Bethell's Purple Podded pea and Kew Blue climbing french bean with 'slender and delicious pods'. And she sent me some Mr Little's Yetholm Gypsy and the promisingly named potato, Forty Fold. If you want to get started seed swapping check out this link to Seedy Sunday or just blog your offerings. Now everyone is busily picking and the produce is coming in thick and fast, the autumn catalogues start coming through the post box promising new potatoes for Christmas - ho! ho! ho! - and fresh veg throughout the year. Here's a few thoughts on what I'll go for next year. Charlotte potatoes (again) - incomparable taste, yield, ease of cultivation and culinary prepartion. Cristo garlic - if I can get it, attractive purple tinge to the skin forming decent sized heads. Long Red Surrey - a carrot which seems to thrive on the allotment's sandy soil- the sort of soil a market gardener told me needs rain everyday and a dose of shite on Sundays. Kale Lacinto - a black kale with sword like blistered leaves which I used to get from Future Foods, no longer in business, tastier than Nero di Toscano and Cavelero Nero. Anyone know who sells it now? Peas - haven't had them for several years but inspired by Daughter of the Soil photographs I'll try some heritage varieties. Broad beans - bored with shelling them I've given them a rest for a few years but I can't wait for that early season taste. Meantime it's back to giving away surplus courgettes to unsuspecting neighbours!